Festivals are part of human life and are meant to bring cheer in our lives. With Christmas, round the corner, why not to try something different that would bring subtle changes to our traditional way of celebration and make this Christmas organic. As cards are the perfect solutions for any gift-giving occasion; and to make this Christmas “Green” send organic greeting cards to spread the message of environmental responsibility, along with cheer and wishes to friends and family members. Here is a way out. With spruce tree Christmas card, make sending Christmas greeting cards better for the environment. These special organic greeting cards are embedded with seeds that will grow into natural flowers once greeting card is planted and is given adequate amount of water and sunshine. As the plant grows right out of the paper, look for flowers like Bird’s Eye, Clarkia, Black Eyed Susan, Poppy, Catchfly and Snap Dragon. This will eliminate wastage of paper and the result will be a beautiful card or tag that’s fully biodegradable. Send your love to your family and friends with greetings cards made with paper waste. These cards come in biodegradable clear packages and can be purchased in the sets or individually. Use recycled or tree-free paper to customize your own greeting card as a Christmas gift. Many online organic gift shops have a complete collection of such cards. 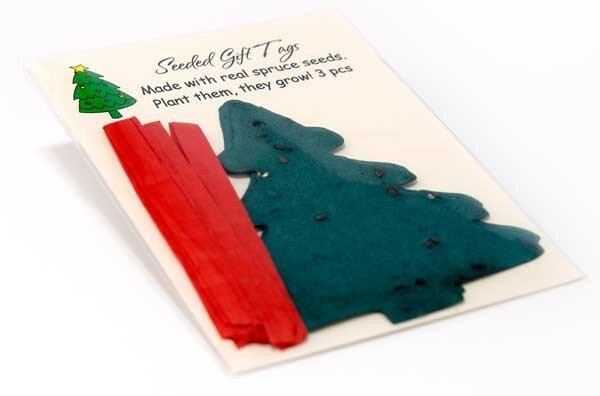 These are the best alternative for spruce tree Christmas cards and gifts. Sending e-cards is also a great eco-friendly way to send wishes and greetings to everyone in your contact list. Eco-friendly Christmas cards and gifts is a great way to send greetings to friends and family with being easy on earth. So, think wisely before picking any Christmas card and gift from the market. Previous Previous post: How to celebrate an eco-friendly Christmas this year?